The Midwest’s newest hotel entertainment destination. A luxury city destination located in downtown Detroit and only 18 Miles (25 mins) from Detroit Metropolitan Airport. A multi-sensory experience with restaurants and nightlife. 335 oversized guest rooms — up to 510 sq. ft.
56 corner suites — with deep soaking whirlpool tubs, floor-to-ceiling wraparound windows for spectacular 90-degree cityscape views and a dual rainhead with triple body wash shower — up to 1,000 sq. ft.
9 Rooftop VIP Suites: 880 sq. ft. Executive Suites, 1,290 sq. ft. Penthouse Suites and 1,720 – 2,030 sq. ft. Grand Penthouse Suites — with private sitting areas and separate sleeping areas. Your guests will enjoy a separate hotel entrance, 24-hour complimentary valet and covered self-parking, resort style spa with infinity edge indoor pool, state-of-the-art fitness center and the award-winning 6 salon. 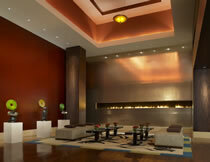 They’ll feed their desires with in-room dining from WOLFGANG PUCK GRILLE or relax in our private Lobby Living Room. Plus, enjoy the latest in-room technology, including 42-inch plasma televisions, high-speed wireless Internet and Technology Butler Telephones with direct “do not disturb” communication capabilities. Take advantage of our exclusive Concierge Level for hotel guests only, featuring complimentary food, nonalcoholic beverages, wireless Internet, 60-inch HDTV, private elevator access and full-service Concierge staff. Step inside a whole new world of dynamic gaming at MGM Grand Detroit. 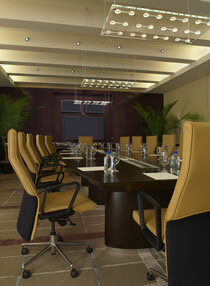 Experience a new level of luxuries with modern décor, spacious walkways and plush chairs in a clean, fresh environment. Feel the excitement of over 90 table games and pull in all the excitement with over 4,000 of the latest slots and video poker. 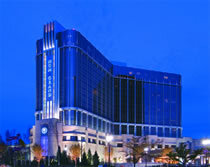 Then go all-in with a full house of non-stop action in Detroit’s premier poker room. MGM Grand has the best Players Club in town… in fact, it’s the best all-around! The MGM MIRAGE Players Club offers slot and table game players the opportunity to earn valuable perks and comps based on your play. The more you play, the more you’ll get! From complimentary dining and rooms to cash back and exclusive promotions, everyone benefits as an MGM Grand Player. 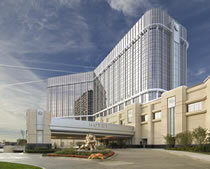 You’re also recognized as a Player in the top casino resorts in the world! Earn and redeem Players Club rewards at participating MGM MIRAGE properties: Bellagio, MGM Grand, Mandalay Bay, The Mirage, TI, Monte Carlo, New York-New York, Luxor, Excalibur, Beau Rivage and Gold Strike, Tunica. Go beyond the threshold of excitement as the pulsating rhythms of live DJs and musicians flow from the hottest lounges in the land. 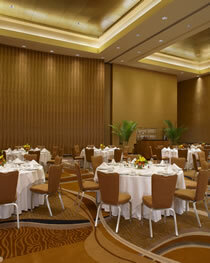 Then, catch big name acts like BB King and Howie Mandel as they take center stage in our stunning Grand Ballroom. With so much high-energy nightlife, it's no wonder we've become the ultimate entertainment destination. If you really want to pamper your guests, a visit to IMMERSE, our 20,000 square foot resort-style spa featuring the award-winning 6 salon, is an event in and of itself. Let your guests experience a new level of pampering and relaxation in nine luxurious treatment rooms, two couples suites (one with Zen garden) and our water therapy room with Vichy Shower. Then, get fit in our 2,300 square foot Active Zone, featuring TechnoGym® cardio equipment, strength equipment, personal trainers, yoga and meditation facilities. Our spa concierge will help your guests design a custom body treatment from our extensive menu of therapeutic marine-based services. Then, they can complete their transformation at 6 salon — voted “Detroit’s Best Salon” four years running by Real Detroit Weekly and “North American Salon of the Year” by NAHA. Let your guests satisfy every craving imaginable at our three signature restaurants. 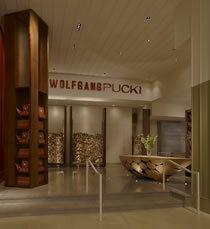 Celebrity chef Wolfgang Puck provides a modern twist on the classic “bar and grill” at WOLFGANG PUCK GRILLE. Here your guests will enjoy casual, sophisticated fine dining, including breakfast and lunch, in a truly spectacular setting. MGM Grand Detroit also boasts two bold new dining concepts from acclaimed chef Michael Mina… Savor imaginative interpretations of classic steakhouse favorites at BOURBON STEAK or celebrate the richness of the sea at SALTWATER, his opulent seafood dining experience. As the sun sets, your guests will feel the heat rise at five of the hottest lounges in the land. 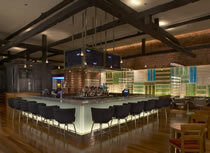 Add fuel to their fire at IGNITE, featuring seating for up to 250 and a Private Cigar Room seating up to 15. Let them experience an interactive environment that’s constantly evolving to enhance their mood and elevate their game at U-ME-DRINK. Dazzle your most distinguished guests in the cozy piano lounge atmosphere of INT ICE. Surround them in aquatic ambiance at AGUA or stir their desires at V, accommodating 300 guests and featuring a Private Bar for up to 30. Then, let them step inside a whole new world of dynamic gaming, where they’ll feel the rush with the hottest table games and the latest slots and video poker machines. All event spaces feature state-of-the-art technology, including wireless Internet, video and teleconferencing capabilities with multiple plasma screens.